Third Annual International Peggy Carter Day! It’s here! Today is April 9th, the birthday of our favorite agent, Peggy Carter! Fans from all over the world are celebrating today by putting on a Peggy-themed T-shirt or Besame’s Red Velvet or simply channeling their inner Peggy Carter! We invite you to share your love and celebration with us by using the hashtags #IKnowMyValue and #WalkLikePeggyDay and #InternationalPeggyCarterDay. We want to see how you celebrate! Share your favorite moments or quotes from the show. Link to your favorite fanfic. Post images of your favorite scenes, or that bit of fandom memorabilia that brings you joy. Tell us why Peggy Carter resonates with you as a character and why you love her so much. You are not alone. We want to share your squee with you! Don’t know what Peggy Carter Day is about? Check out this post and links here. 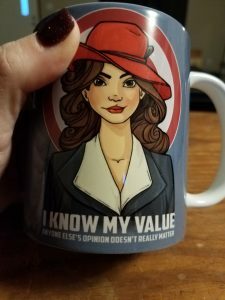 It dawned on me when I reached for my favorite mug this morning that in a little over a month, it will be time to celebrate our love for our favorite agent, Peggy Carter! I can’t believe this is our third year running. Last year we picked up some new members, and I want to make this year special for everyone who loves Peggy like we do. If you’re new to International Peggy Carter Day, a detailed explanation of our mission statement and our activities last year is listed here, including links to our Facebook group and the hashtags to use if you’d like to participate. 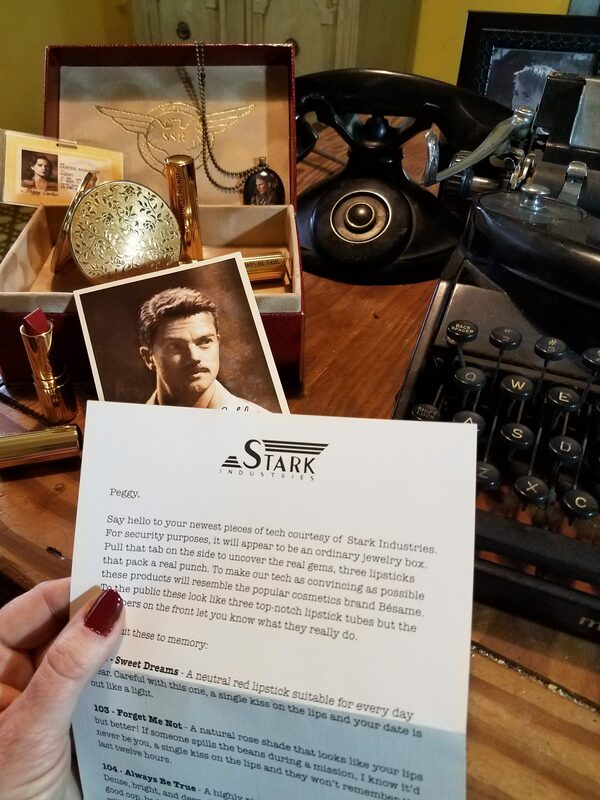 I highly recommend reading the previous post to get a feel for what we’ve done in the past, but the short version is every year on April 9th, Peggy Carter’s birthday, fans from all over the world pay homage to our favorite agent in our own individual ways. You can dress like Peggy, if that floats your boat. For many of us, that’s part of the fun of Peggy Carter Day. You can participate in a scavenger hunt (more on that as the day grows closer). Show support for the organization of your choice–every year we recommend showing some love to your national Alzheimer’s organization, but we’ve also shown support for the #MeToo movement as well. We encourage you to share your love on social media on April 9th using the hashtags #PeggyCarterDay and #IKnowMyValue. If you’d like to join our Facebook group, check us out here. There will be more updates, plans, laughter, and sharing as we approach the big day. We’re looking for ideas on how to spread the joy, so come on over and join in the planning. But here’s the most important thing about Peggy Carter Day. We encourage everyone from all walks of life to know their value. Own it. Embrace it. Peggy is an inspiration to us all. Yes, I know it’s been a long time since I posted last, but I’d be remiss if I didn’t remind people that the 2nd annual celebration of International Peggy Carter Day is coming up soon–April 9th to be exact! On April 9th, 2018, in honor of our favorite Agent’s birthday, we invite Peggy Carter fans to join us in celebrating a character that has brought so much into our lives by taking part in the Second International Peggy Carter Day. How do you participate in International Peggy Carter Day? 1. On Monday, April 9th, 2018, channel your inner Peggy Carter! Maybe it will be by wearing something Carter-inspired like those retro sunglasses, or those Mary Jane pumps you love so much, that power suit that makes you feel professional and confident, or a stout pair of Army boots. Carry that Stratton compact or tuck a compass in your pocket. Paint your nails red or put on a red fedora. Do whatever makes you feel like Peggy. Maybe the only thing you have to put on is attitude. 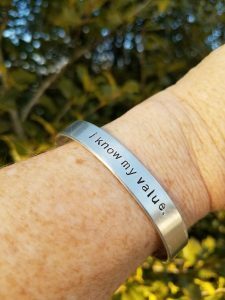 Tell yourself “I know my value.” Believe it. Don’t let anyone make you feel otherwise. 2. 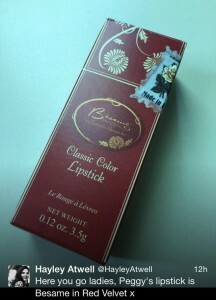 Revel in the feeling of empowerment this brings you, you deserve it. Maybe this is the day you ask for that raise or negotiate a better loan. Tell someone you love them. Stand up for what you believe in. Stand up for someone else. Stand up for what’s right. This is your day. Own it. 3. Take pictures! Share your pictures or experiences HERE and on Facebook, Twitter, Tumblr, Instagram, and across your social media sites #PeggyCarterDay and #IKnowMyValue). Share on your LiveJournal, Dreamwidth, and Imzy accounts. Spread the word among your friends, too. Be sure to tag them on their social media sites too! If you want a Field Kit you’d better hurry–there aren’t that many left! You can certain do that again! But we’d also like to support the Time’s Up movement this year. This is an international celebration! We want to see Peggys from all over the world! So be sure to seek out the groups in your area and share the information. 5. We’re also encouraging people to post a picture of themselves holding up a whiteboard or sign with the words: I know my value because______. Fill in the blank with the word that makes you feel your self-worth. Some people may feel they can’t participate because they aren’t into cosplay or they don’t look anything like Peggy Carter. We encourage people to participate in any way they feel comfortable, the key sentiment here is to embody her spirit in any way you want. It doesn’t matter if that embodiment is external with clothing, or internal with attitude, something else entirely, or all of the above. Anyone can participate. We can all be Peggy if we choose. Every time you get a group of Peggy fans together, you’re likely to hear how much the character has impacted their lives for the better. In Peggy, we have a heroine who is not a superhero, who doesn’t have special powers, but who gets the job done through hard work, competence, intelligence, and grit. Who has loved and lost and has persevered through much adversity. Who isn’t perfect, but owns up to those imperfections to always do her best. Many Peggy fans have already embraced the idea of emulating everyone’s favorite agent on a daily basis, but for some, this is a new concept. So join us for International Peggy Carter Day.